Pergamin at Długa Street is an unusual place where we effectively combined the historical climate of a secluded Krakow tenement house with comfortable interior decoration. Our key asset is a perfect localization and also the highest standard of service for guests travelling both for recreational and business purposes. 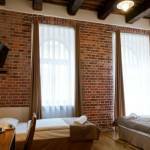 The Aparthotel is located 5 minutes walk from the Main Market Square. The localization at Długa Street guarantees also an easy drive to other interesting Krakow tourist attractions. Reserve your accommodation and Aparthotel Pergamin will directly send the confirmation in 1 workday.